Wow, what did you think of the opening ceremonies of the Olympic Games? I thought they were short and sweet and of course, our athletes were the best dressed. Brian Adams and Nellie Fertado sang well together. It was awfully late though. By the time we went to bed I was so beat that I slept in really late this morning. We went to the farmers market in the little city just before lunch. We bought a nice looking eye-of-round roast for our fondue tonight. The only one that was on display was three times what we needed so we asked if the butcher would cut off a portion for us. He said he would but if we took the whole thing he would reduce the price by $4. I guess that he really didn’t want to take it home with him. It was a great deal for us, too. We just cut the roast into three portions when we got home and we’re set for another two fondues. 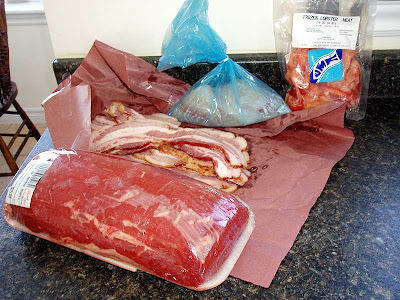 While we were there we also bought some bacon, haddock filets, lobster meat and eggs. We are planning to make seafood chowder for our Valentine’s Day supper so we’ll be using most of this tomorrow. Mmm… seafood chowder. 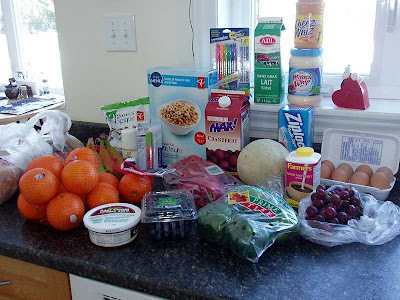 Next up was a trip to the grocery store where we bought the rest of our supplies for the week. This was a much better experience than in the big city last week. The store was almost empty and we found an open cashier when we were ready to check out. Hubby actually made it out of the store in a good humour. Stay tuned for some pictures of our fondue. I’m going to go get it ready now and then watch some of the Olympics. That is a huge roast for 2 ppl, I agree, but you got a great deal :-) I go the lazy way, I buy the beef already cubed! Your dinner sounds delicious tonight, as does your seafood chowder tomorrow. YUM. Can't wait to see fondue pics! It's funny that we're almost neighbors yet our brands of dairy products, even containers are very different. I slept in til 10 am, much later than usual too...was up til 2 am by the time the ceremonies finished and I decompressed.... it was great though! For this stle of fondue we slice the meat, cross-grain, into as thin of a piece as we can get. It helps to partially freeze the meat before you cut. A deli slicer is the perfect way to go but we don't have one of those. Years ago we had an inside track with a friend at one of the local grocery stores who would let us know when the meat was on sale and then freeze us a piece and slice it into beautiful thin slices, but now we just do it ourselves. It isn't as pretty but it works out just as well. By the way, we first had this meal in a restaurant in Montreal about 30 years ago. They called it a Chinese fondue and that's how we still think of it. It was delicious tonight, as usual, and I'll share some pictures tomorrow.